Part of the due diligence in discussing applications with our customers is gathering an understanding of their application process and needs. In emails, phone calls, or online chats, we determine the parameters and constraints of the application to be sure that we have a proper solution to offer. And, if we don’t, we explore custom solutions or help find something available outside of EXAIR. 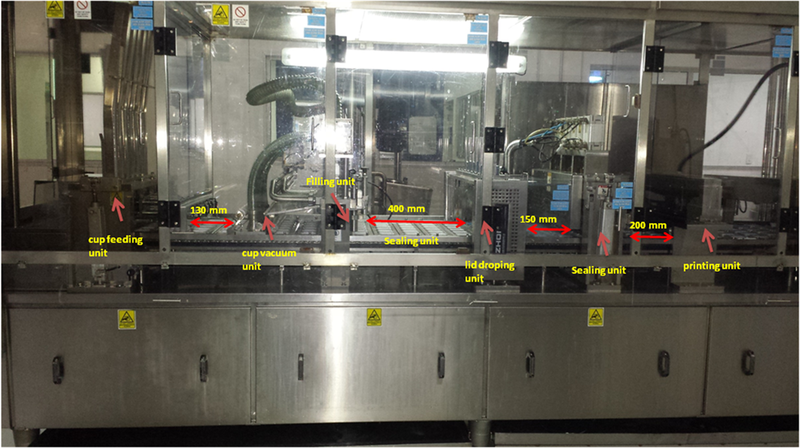 In a recent email exchange with a yogurt manufacturer I received the photo below showing the filling process for their yogurt cups. The adage goes that “a picture is worth a thousand words”, and it certainly holds true here. The full process is shown, with labels and dimensions. What more could you ask for to understand the flow of the application? 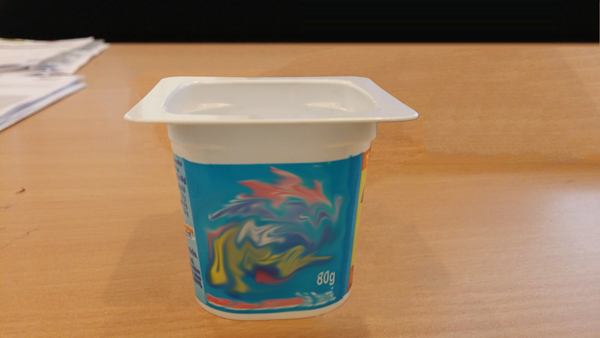 In this system, small dust particles were adhering to the internal walls of the yogurt cups. When the cups would pass through the vacuum unit, the station designed to remove any dust or debris, static cling would prevent the system from removing all the dust. Then, in the filling station, yogurt would be fed into insufficiently cleaned cups, resulting in defects and wasted product. This customer contacted EXAIR in search of a solution to remove the static on the inside of the cups, and to help facilitate removal of the dust, if possible. What they found was a perfect solution in our Super Ion Air Knife. When the cups exit the feeder and enter the conveyor, they are placed in the same orientation with (6) cups across the conveyor over a width of 580mm (22.8”). By installing a static eliminating solution over the conveyor at this point, we can remove the static before the cups enter into the vacuum cleaning station. And, if we can provide a blowoff source as well, we can remove the dust particles before the cups are cleaned again via the vacuuming system. The solution for this application was the stock model 111024 24” Super Ion Air Knife along with model 7907 Power Supply. This Super Ion Air Knife provides a fully laminar and consistent sheet of static eliminating air, removing both the static and debris from inside the yogurt cups. Operating at a low pressure (~20 psig), these units are also quiet and consume low volumes of compressed air. By installing the Super Ion Air Knife into this application, this customer found a solution to remove both static and debris from the product. In doing so, defects were eliminated and output was increased. If you have a similar application in need of a similar solution, give us a call. We’ll be happy to help.